Well, it was apparently street legal in 1962 at least. In case you had any concerns about reliability; read about these guys driving this kart around the world. You don’t need a trailer or a station wagon to haul this kart to a track you can drive it there on public roads! DRIVING a kart is a real thrill. Seated on a low-slung frame only inches from the ground, you feel as if you’re doing 80 mph when you’re doing 20. Yet it’s surprisingly safe. The low center of gravity and a width two-thirds the length make it almost impossible to flip a kart in a tight turn. Just about everyone who tries a kart gets the urge to own oneâ€”and if you’ve got that urge, you get a bonus in building the MI Highway Kart. Since karts are generally driven on special tracks, it is not necessary to register them. However, transporting a kart is often a problem. It can be hauled in a station wagonâ€”if you own a wagonâ€”or it can be towed on a trailer. Either way, the lugging can be quite a nuisance. With this in mind, our model was designed so that registration could be obtained, making it possible to drive the kart to its destination on public roads. Our plates were obtained in New York. However, regulations vary and the requirements would have to be checked in other states. First we had to supply three things: proof of ownership (a bill of sale for the engine); an affidavit stating that the kart was built by ourselves; and a list of the parts used. 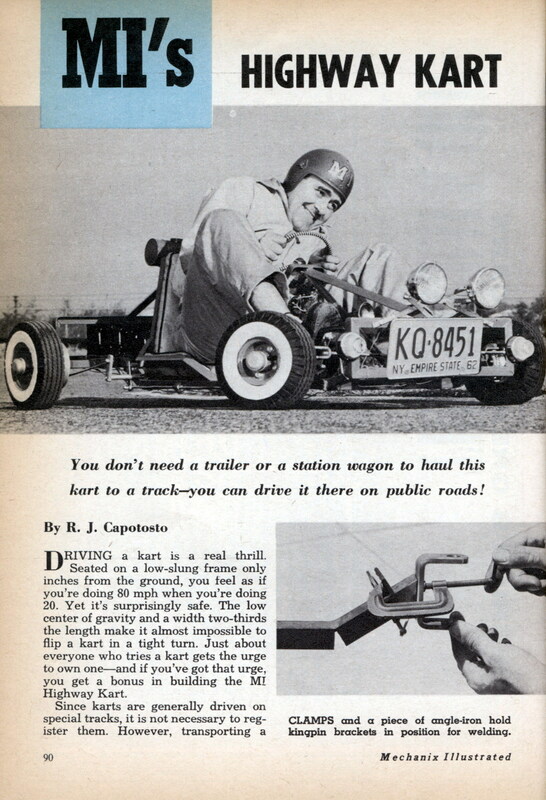 To make the kart legally roadworthy it had to have front and rear bumpers, a brake on each rear wheel, headlights, taillights, turn signals, a rear license plate and a horn. In use, the headlights are required to be 24 inches above the ground. A permanent arrangement of this sort would not be desirable, so we mounted the lights on adjustable brackets which allow them to be lowered. 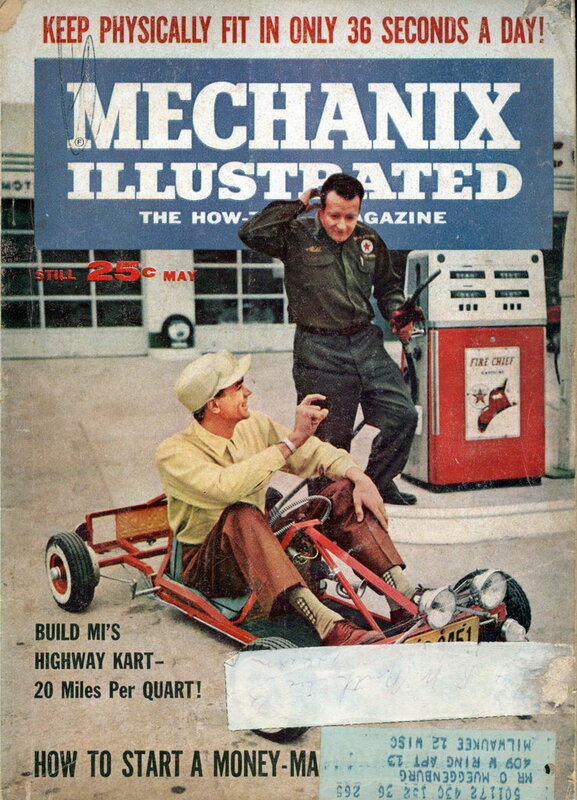 Electrifying the kart was simplified by using a Clinton E-65-1100 series engine with a built-in, 12-volt flywheel generator. This eliminates the need for a heavy battery, relay and external generator. The engine delivers 5.2 hp and it has a 5.76 cubic inch displacement, putting it in the Class A category. It is fitted with an impact starter and four turns of the crank followed by a press to release the spring are sufficient to start the engine. A Mercury centrifugal clutch permits no-load starting and load-free idling and it automatically applies the load to the engine at its most efficient speed. Brakes are the six-inch internal expanding type. If you do not plan to register the kart, one brake will be sufficient as a Class A rig. For simple and sturdy construction, angle-iron is used throughout. This eliminates welding of fish-mouth joints on tubing, something which is rather difficult unless you’re an experienced welder. Welding angle-iron is very easy by comparison. It’s also easy to shape the angle-iron by cutting slits or notches in one side and bending it in a vise. Start construction by cutting all the angle-iron to size and forming it as shown in the drawings. Cut the notches with a hack saw and save the triangular waste pieces. These can be used to fill in the spaces formed where the slits open up on reverse bends. When cutting notches, drill a 3/16-inch hole at the base of the V to allow proper bending clearance. File all cuts clean to remove burrs prior to welding. The 3/8-inch holes for the brake and throttle studs should also be drilled at this time. To simplify the welding, clamp the pieces together and tack-weld them first. Then check the positioning to see if it’s all right to complete the welds. We used a Lincwelder 100 and obtained excellent results. I was wondering how much of a chance someone would have of actually registering one of these today. And if you were to modify the plans to use one of the aftermarket scooter engines, if that would make it easier.